Lakers Take Epic Game 7, Seize 16th Championship…Here go the Dominoes. It’s been a week since the Lakers beat the Celtics in an epic game 7 to capture franchise title number 16, just one behind Boston’s all-time 17 NBA championships. Back to that in a few paragraphs. And with Lakers head coach Phil Jackson leaning towards retirement because of health issues, the rest of the league is getting ready for next season with today’s draft that’ll, most likely, see Kentucky point guard John Wall chosen first with the top overall pick by the Washington Wizards. The Zen Master at work. Funny how the Zen Master is THE DOMINO. When he falls, so will free agents, including LeBron James. Here’s why. Jackson’s health could prevent him from returning to the Lakers Bench next season and end any talks of a fourth, three-peat. Waiting in the wings is former Lakers guard Byron Scott. Scott won three championships with the “Showtime Lakers” in the 1980s and covets the Lakers coaching job. He’ll always be “family” when it comes to the Lakers and his good friends Earvin “Magic” Johnson and Dr. Jerry Buss. 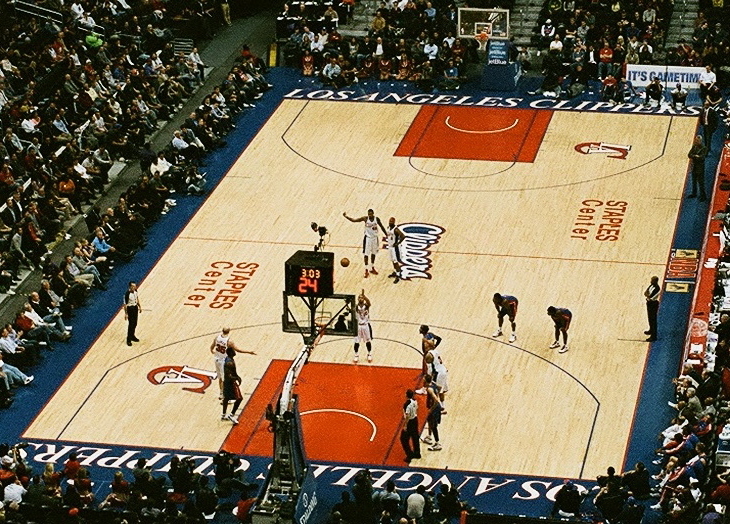 Scott guided the New Jersey Nets to two straight NBA finals. He’s won Coach of the Year honors with the Nets and New Orleans Hornets. Scott’s one of the hottest coaching commodities with prime jobs like the Cleveland Cavaliers bench spot open. With Michigan St. coach Tom Izzo deciding to decline the Cavs offer, Scott’s the prime target in Cleveland. The job’s his if he wants it. He’s decided to wait to see what Jackson decides next week. If the Lakers job is available, Scott will want it. That’s assuming one of Jackson’s current assistants, namely former Lakers guard Brian Shaw, isn’t promoted to the top spot. Mega-free agent LeBron James could be persuaded to remain with the Cavaliers if they hire Byron Scott. LeBron likes the fact Scott’s been a part of seven NBA finals either as a player or coach. Scott commands respect among players for the simple fact he IS one. So, it’s up to Jackson. If he comes back for the fourth, three-peat, Scott’s headed to Cleveland with the good possibility LeBron stays. Jackson retires, Scott’s on the Lakers bench with Cleveland back at square one and LeBron entertaining offers from the Chicago Bulls, New York Knicks, New Jersey and the L.A. Clippers. So, with all this on the NBA horizon, gives me a good moment to reflect on last week’s championship game between the NBA’s two most storied franchises. That was, truly, the best pro basketball game I’ve seen in some time. If nothing else but for the simple fact that it was a game 7 showdown between the Boston Celtics and the, now, two-time defending World Champion Los Angeles Lakers. It helped they have that finals history going against each other for all the marbles for the 12th time and extending to a game 7 in five of those with the Celtics taking the first four prior to last Thursday’s break-through for the repeat championship by the Lakers at Staples Center, 83-79. As good as the game was between the two Finals rivals, there’s still no way the series should’ve gone the distance. The Lakers, clearly, were the better team even without 7-foot center Andrew Bynum at full strength. Should’ve been done in five. Speaking of game five, and backing up my point, the Celtics held the Lakers to 39% shooting for the game while themselves filling it up at a 56% clip, yet were fortunate to come away with a 92-86 win. Same deal in game four. Down 3-2 and facing elimination, the Lakers just smeared the Celtics in game six at Staples, 89-67. Huge turning point. Celtics lost center Kendrick Perkins to torn knee ligaments early in the first quarter with game 7 looming. So, that set up the deciding game with Perkins missing from the Celtics line-up and Bynum really ineffective at this point although he did average nine points and seven boards in the series. Pretty good for a guy playing with a knee tear. By the way, for all you Celtic fans who claim an 18th title didn’t happen because Perkins went down, it can be argued had Bynum been 100%, the Lakers might’ve swept the Celtics. This series was all about the defense and you’ve got to give it up to both Celtics coach Doc Rivers and Jackson for making the proper adjustments to go for the championship. Game 7 looked more like an NCAA elite eight battle with both teams playing text-book defense. Couldn’t believe what I was seeing. For three quarters, the Celtics, with that “nothing to lose so let’s go for it” attitude, looked as if they were going to script another disastrous game 7 ending for the Lakers at home against Boston. 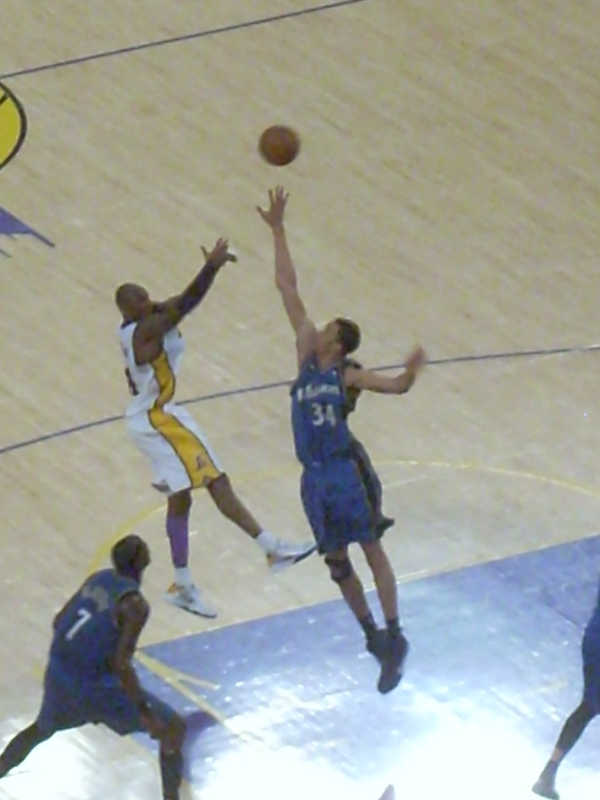 The Big 4 of Paul Pierce, Kevin Garnett, Ray Allen , Rajon Rondo and company, were playing championship defense triple-teaming Kobe Bryant and holding the Lakers to 29% shooting from the field in the first half alone. Problem for the Celtics, the Lakers dominated the boards. Bryant himself had 15. So, although they couldn’t score, the Lakers got plenty of second-chance opportunities they converted keeping them in the game. After opening a 13-point third quarter lead, the Celtics looked golden. But the old guys ran out of gas and the Lakers took over. While they made their run to take the lead spear-headed by Pau Gasol, the “help, or weak side defense” looked like Duke’s trying to stave off Butler for the championship. If you’re a Boston fan, you hated it, which is understandable. If you’re Lakers fan you, obviously, loved it. If you’re a basketball junkie, you had to have been impressed by it for the simple fact they usually don’t play like that in an NBA game. Plenty were complaining because of the lack of offense in the game. That’s what happens when both teams play good defense adjusting on the fly and one team dominates the glass. Remember what coaching icon Pat Riley likes to say. Either way, it was like watching a nail-biter of a Super Bowl. Congratulations to both the Lakers and Celtics for playing a game 7 for the ages. Along with NFL Training Camp hold-outs, here’s another rite of Summer, the Clippers are on the clock! Who is Al-Farouq Aminu? Well, “The Chief Has Arrived”. That’s what Al-Farouq means. And, apparently, he IS “The King”. He descends from a line of Nigerian Kings. Take that, LeBron! Yeah. But can THIS King go left? Prior to these NBA Finals, the Los Angeles Lakers and Boston Celtics have battled for eleven championships, four of them going to a Game 7 with the Celtics taking them all. In his 12 previous trips to the NBA Finals (10 wins) Los Angeles Lakers head coach Phil Jackson’s never had to win the ring in a Game 7. He did win a ring as a player with the New York Knicks in a Game 7 win in 1970 over the Lakers. Lakers guards Kobe Bryant and Derek Fisher have been to the Finals six previous times never having to win it all in a Game 7. All the current Boston Celtics have never gone to a Game 7 with the ring on the line. There’s a first for everything and everyone. It’s a must win for both teams with both team leaders looking at it as just that. Kobe Bryant and Celtics forward Paul Pierce know what’s on the line and know it’s just about one win. So, here we go. Sure I’m biased. But, honestly, this series should never have gone this far. The Defending Champion Lakers are, clearly, the superior team and should’ve taken this thing in five games. In game five, the Celtics took the 3-2 series lead at the Garden playing desperately as they should have. They shot over 60 per cent holding the Lakers to about 33 per cent. The Celtics looked like the 1992 Dream Team. The Lakers looked like the 2009-10 New Jersey Nets. Yet, the Celtics were fortunate to come away with a 92-86 win. Kobe Bryant was the only Laker who showed up knocking down 38. The unbeatable Lakers showed up in Game 6 holding the Celtics to 67 points while the Lakers tallied 89 points for the win. Pau Gasol, Ron Artest, Lamar Odom and the Lakers bench turned it up and showed the world why they’re the defending champions. Unfortunately for the Celtics, center Kendrick Perkins is out damaging knee ligaments in the first quarter of the last game. That leaves plenty of room for Gasol to have his way in the paint. “Big Baby” Glen Davis, Rasheed Wallace, KG and others will platoon to defend Gasol. He’ll have another double-double. Perkins’ injury makes it a “push” with Lakers center Andrew Bynum nursing a knee that will be operated on after the series. Difference is Bynum’s playing. Bynum’s been tough averaging about eight points, four boards and three blocks in limited minutes. That’s all they need. It’ll be close for awhile. But look for a Lakers Repeat with another 20 point win. Time for L.A. to party……with championship number 16! John Robert Wooden was a man who came from humble beginnings never forgetting, in his 99 years on this Earth, where he came from. Wooden was taught humility by his father, Joshua, who he called the wisest man he’s ever known. In turn, he passed his father’s wisdom on to the two children he and his beloved wife and true love, Nell, had together. That wisdom was passed down to seven grand-children and 13 great grand-children. Wooden passed what his father taught him down to the hundreds of student-athletes he coached from Dayton High School in Kentucky, to South Bend Central High School in Indiana, to Indiana State University, to UCLA. How fortunate they all are. Friend. Caring. Honest. Grateful. The most humble person you‘ll ever know. Father figure. The best coach. That’s how former UCLA point guard Henry Bibby described Wooden just a few hours before the legendary Bruins coach passed away from natural causes. Wooden had been at Ronald Reagan Medical Center at UCLA in grave condition for 10 days. I saw him last weekend. Bibby said. He said to me, ‘Henry, I love you.’ I told him, I love you too, coach. 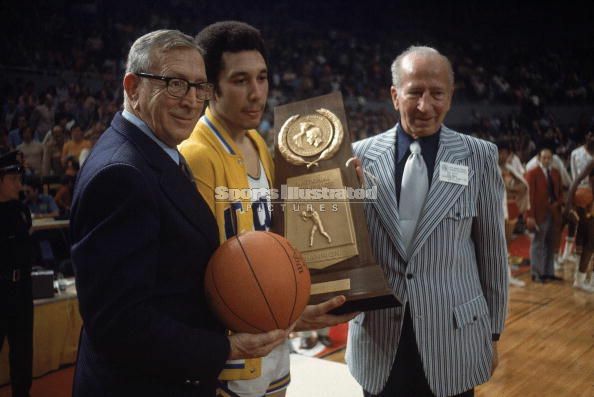 From 1970 to 1972, Bibby honed basketball skills Wooden taught as the starting point guard for three of UCLA’s 10 National Championship teams under Wooden. Coach was always so humble. With all our success, he never took the credit. For him it was all about the players who were part of the team. And like all of Coach Wooden’s players, he learned more than basketball skills, Bibby learned life skills. If we’re honest with ourselves, we’re honest with others. Treat people the same and live by your word. A native of North Carolina, Bibby was being recruited by Norm Sloan at North Carolina State and UCLA. Wooden paid him a recruiting visit along with Kenny Washington, a guard on the Bruins first two National Champions under Coach Wooden. Of course, the rest is Bruins history and the beginning of an incredible relationship for Bibby. From learning the proper way of putting on socks and lacing sneakers to avoid blisters, to absorbing philosophies like “failing to prepare is preparing to fail” or “be quick, but don’t hurry” to learning a Pyramid of Success for life on and off the court, Bibby learned well. He educated me and continued to be ’my father’ throughout my entire career. All the while, almost daily conversations with Coach Wooden for advice. After his playing days were over, Bibby began a successful head coaching career in the Continental Basketball Association culminating with nine years at the University of Southern California, UCLA’s arch and cross-town rival. 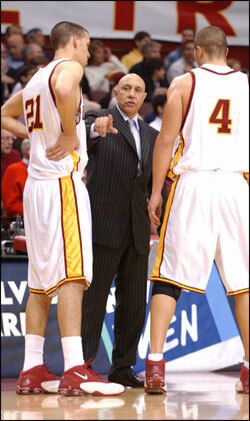 Bibby led the Trojans to three tournament appearances including an Elite Eight appearance in 2001. 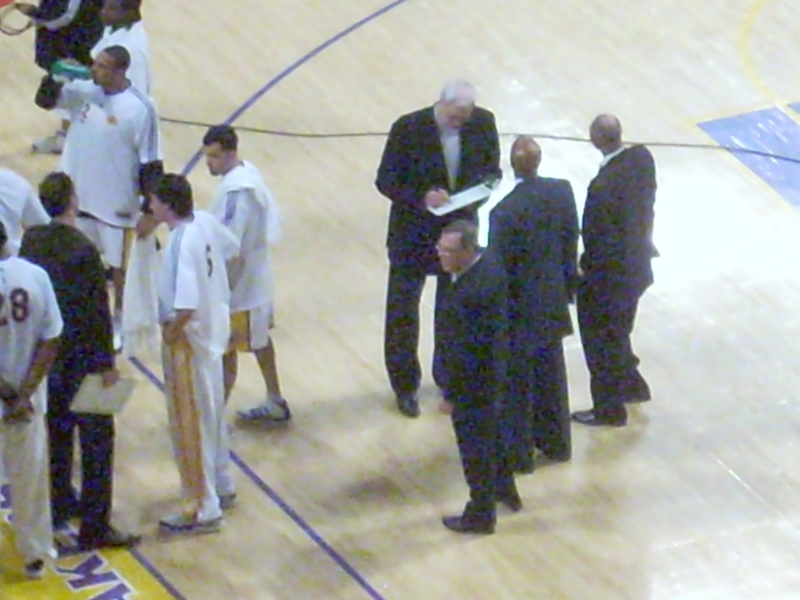 Upon his hiring by USC in 1996, Bibby recalled a conversation he had with Coach Wooden. Bibby’s coached the WNBA’s Los Angeles Sparks and has been an assistant coach for a number of NBA teams including his current position with Lionel Hollins and the Memphis Grizzlies. I owe my entire career to coach Wooden. I’m so grateful to have him in my life. He‘ll always be with me. Coach Wooden will be with all of us, always. For proof, seek out his players or read the words of a current UCLA student whose parents probably never saw Wooden coach. Wooden was a coach to all of us. He just used basketball as his vehicle to teach us. *Bibby’s one of only four players to win an NCAA Title and NBA Title in back-to-back years. 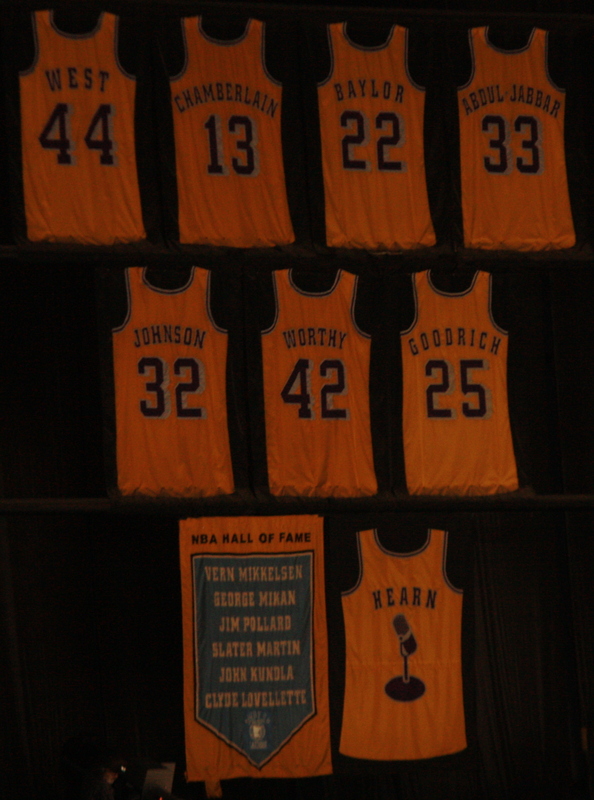 The other three are Bill Russell, Earvin “Magic” Johnson and Billy Thompson. Lakers-Celtics, Chapter 12 Act 1. 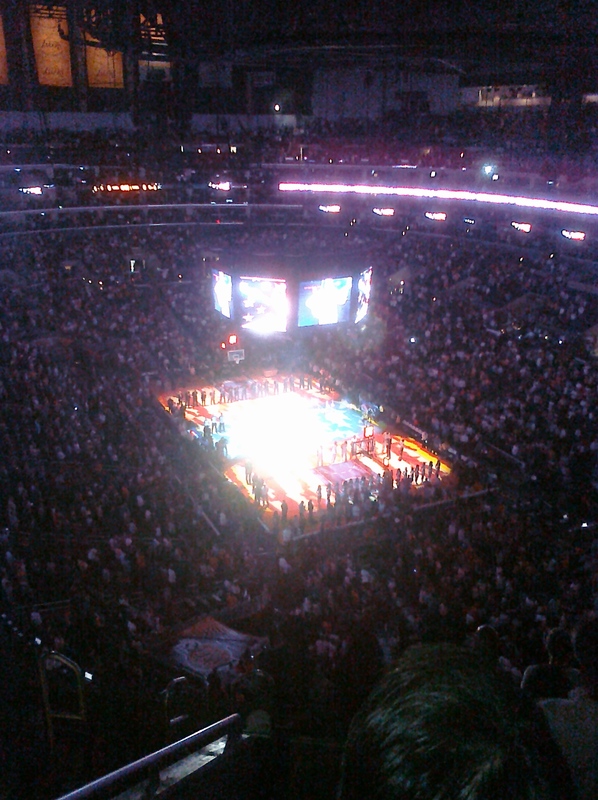 What a fabulous time for basketball in the City of Angels……Los Angeles and Boston. Led by Kobe Bryant, Pau Gasol and Phil Jackson the defending world champion Lakers are in the thick of their third straight NBA Finals and facing them, their arch rivals, KG, Ray Allen, Paul Pierce and the Boston Celtics. INCREDIBLE! 63 champions in the history of “the Association” and these two teams have combined to win 32 of them. Boston has won 17 titles in 21 tries while the L.A./Minneapolis Lakers have earned 15 championships in a staggering 30 tries. Think about it. The Lakers have represented the West in almost half of the finals while the Celtics have represented the East in a third of them. INCREDIBLE! This is the 12th time these franchises have clashed head-to-head for the title with the Celtics winning a lop-sided nine of the first eleven including the one two seasons ago. Lakers came out with purpose in game one of the 12th installment, their 31st finals appearance, at Staples Center in Los Angeles Thursday night beating the Celtics, 102-89. The Lakers had everything going especially on the defensive end looking like the Celtics usually do……………STRAIGHT UP, PHYSICAL! Meanwhile, the Celtics looked old, beat up and just plain tired. The Lakers out-rebounded the Celtics, 42-31. The Lakers limited the Celtics to one for 10 from the three-point line and took the all-important “second chance points” category, 16-0. Quite uncharacteristic of the Celtics. Lakers superstar Kobe Bryant led everyone with 30 points. 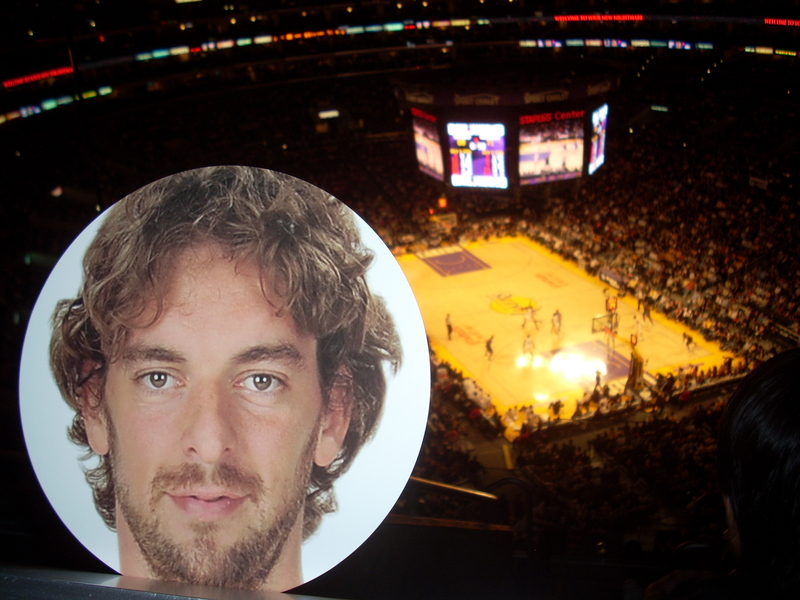 Pau Gasol had 23 points to go along with 14 rebounds. Finals “rookie” Ron Artest had 15 points but gave Celtics forward Paul Pierce fits on the defensive end. Pierce did have 24 points but those were mostly in garbage time. Same goes for Kevin Garnett. He had 16 for Boston but looked like his knees were smarting and was completely out-played by Gasol. OK. Remember, it’s just game one. In four other meetings between the two teams in the finals, the Lakers have taken the first game only to see the Celtics come back to win three of their 17 championships. You can bet the Celtics will play more like themselves come game two Sunday back at Staples. They’re champions and Celtic Pride is quite a force when summoned. Expect game two to be much closer and much more physical on both ends. Expect the Lakers to get a hard-fought win and a two-zero series lead going into Boston for the middle three games of the series next week. ENJOY! God bless “The Wizard of Westwood“, 99-year old John R. Wooden. The former UCLA Basktball Coach who led the Bruins to 10 NCAA Championships lies in grave condition. Talk about a man who lived by “carpe diem“. Considering freshmen couldn’t play when Wooden coached and he practically had to change his roster every three years, Wooden is the greatest coach in team sports history. Wooden’s “Pyramid of Success” is a blue print for, not only sports, but life in general. As a sports fan who was raised in Los Angeles loving the Los Angeles Rams, Lakers, Kings and Dodgers, is it wrong that my favorite baseball player is New York Yankees shortstop Derek Jeter? As a fan mind you, I CAN’T STAND THE YANKEES! “King James” might be the reigning two-time NBA MVP, “Kid Kobe” is STILL the best basketball player on the planet. Protest All You Want. But, Understand Those References. Ordinarily, I wouldn’t even discuss politics and sports together. But, when the two are combined, shoved in your face, slandering the greatest country on Earth in the process, I can’t help but discuss the issues surrounding their collision. Stems from Senate Bill 1070 passed by the Arizona Legislature earlier this month. The intent, as it is written in the bill itself, is to discourage and deter the unlawful entry and presence of aliens and economic activity by persons unlawfully present in the United States. The Bill itself is a Federal one and has been in existence since the days of FDR. The Bill is administered, among other instances, when you are stopped for a traffic violation and the police officer requests you provide your license, registration and proof of insurance. The Bill is in place to protect American Citizens and Foreign Citizens of ALL Nationalities who are in the United States LEGALLY. Here’s where the passing of SB 1070 by the Arizona Legislature intersected with sports. Honor our Latino community and the diversity of our league, the state of Arizona, and our nation. No problem with that whatsoever. It’s not usurping, they just copied it, is what they said they did, the legislators. Then they give it some teeth to be able to enforce it. We are not happy with the position that Phil Jackson took. We want to call on Jackson and the Lakers to put on their Los Lakers jerseys, especially considering the tremendous support that the Lakers have enjoyed from the communities specifically targeted by the misguided and racist Arizona law. Nothing wrong with Lopez’ statement and request after Jackson’s comments and in protest of SB 1070. The L.A. City Council voted 13-1 to boycott Arizona products citing that Arizona’s Immigration Law is reminiscent of what the NAZIS did in Europe during the 1930s and 40s. Understand California’s Immigration Law is more stringent than Arizona’s. In a statement prior to Monday‘s Lakers playoff game against the Suns, Coach Jackson said he wasn’t choosing sides in the matter and applauded the right of all peaceful groups to protest. Move to Monday’s NBA Western Conference Finals opener in Los Angeles between Jackson’s Lakers and Sarver’s Suns. 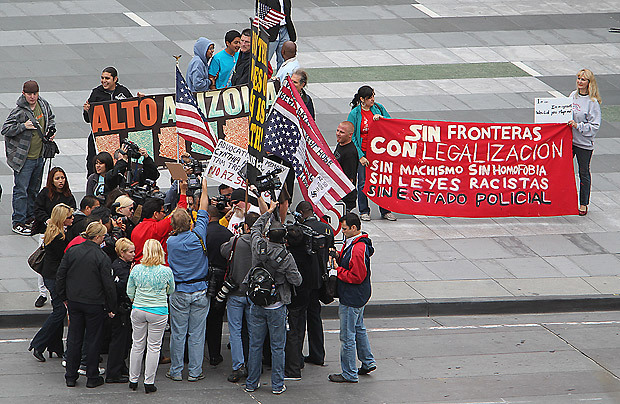 A protest was staged against SB 1070 and Jackson outside Staples Center with some protesters waving inverted American Flags with Swastikas on them. Previous protests against SB 1070 also accused the members of Arizona’s Legislators of being NAZIS because they passed the Bill. Comparing the Arizona Legislature’s passing of SB 1070 to NAZI Germany IS A PROBLEM. To do this is OUT OF LINE. Understanding the inhumanities the NAZIS orchestrated in Europe during the middle of the 20th Century and comparing those NAZI inhumanities to a Federal Bill designed to PROTECT LEGAL CITIZENS OF THIS COUNTRY, BE IT FOREIGNERS OR AMERICANS, is IGNORANT, INSULTING TO THOSE WHO SUFFERED NAZI ATROCITIES and DEMEANS THOSE ATROCITIES COMMITTED BY THE NAZIS. I challenge all those who have the audacity to make such a comparison to visit the Museum of Tolerance in Los Angeles and experience NAZI atrocities through its collection of photographic and material evidence. Maybe then they will understand the comparison IS out of line. Here’s a head start. Between 1933-45, NAZI Germany illegally invaded every Continental European Country in Adolf Hitler‘s quest to rule the world. In the process, Hitler illegally revoked every Jews citizenship, stealing their possessions and right to live. Six-million Jews and those that “collaborated” with them (some five-million non-Jews including Christians and Catholics) were all part of his Final Solution to systematically exterminate the Jewish Race from existence. Those 11-million humans were MURDERED. Among the atrocities to innocent men, women and children, Jews and their “collaborators” were executed by firing squads who shot them in the back after forcing them to dig their own graves. They were asphyxiated in trucks minus ventilation breathing in the exhaust from pipes in the truck. They were herded in cattle-cars to concentration camps where they were enslaved and experimented on in horrible ways which included being submerged in freezing water to determine how long it took to die in such conditions. Unmentionable surgical procedures were performed without anesthetics. Unspeakable torture was performed until death resulted. Their skin was used to construct lamp-shades. Their flesh used to make soap and candle-wax. Their hair used to make pillows. Their teeth extracted to profit from gold fillings. Their possessions sold. Entire families were wiped off the face of the Earth. So, these questions have to be asked of those who’ve made the out of line comparison between the Atrocities of NAZI Germany and the Arizona Legislature‘s passing of SB 1070. Where does SB 1070 read Legal Citizens will be stripped of that legal citizenship? Where does it say Illegal Persons will be herded, enslaved and experimented on in horrific ways resulting in certain death? Where does it say those Illegal Persons spared of those horrors will be gassed in chambers disguised as showers until they are dead and then, to get rid of any evidence of wrong-doing, cremated in ovens the size of apartment complexes? Where in SB 1070 does it read the intent of this Bill is to perform Genocide on a race of people? Fact is, IT DOESN’T SAY ANY OF THIS! Those groups frustrated, angry and in disagreement by the passing of a Bill designed to protect, in a legal, peaceful and humane manner, the LEGAL, TAX-PAYING CITIZENS of its States and Country against ILLEGALS who come here to manipulate the system, have every right to do so. That’s what makes the UNITED STATES OF AMERICA THE GREATEST COUNTRY ON THE FACE OF THE EARTH. That’s why people from all over legally, and SOME ILLEGALLY, ENTER THIS COUNTRY. America provides them Freedoms they don’t have in their country of origin. But to protest disagreements by waving inverted American Flags adorned with Swastikas and to compare Arizona’s Immigration Law to NAZI IDEALS is way off base and, honestly, those protesting in this manner should be escorted out of this country never allowed to return. They should try that in their country of origin. Odds are they’d get thrown in jail. U.S. Citizens in the Latino Community, go right ahead and protest all you want. That’s your constitutional right as legal residents in this country. L.A. City Council Members, go ahead and vote to boycott Arizona products because they passed an immigration bill you believe to be unconstitutional even though it‘s been Federal Law for decades. That’s your constitutional right. So, in defending your constitutional rights, PLEASE be mindful of comparisons used to make your point in protest because your ignorance and lack of knowledge of events, such as the NAZI ATROCITIES, you used only works to damage your credibility and that of your cause. Remember, knowledge is power. Ignorance is just what it is. And how about leaving ignorant and intelligent protests out of sports (especially the ignorant ones) unless they’re about sports. Individual stats don’t mean a thing here. I could throw them down. But why? You already know them, can find them on many assorted web sites and they speak for themselves. We are ALL WITNESS to the ONE. Not too long ago in the “Hoops Kingdom,” there once was a little prince Los Angeleno’s affectionately called “Kid Kobe.” Like LBJ, Kid Kobe entered the “joust” at the tender age of 18 years old. The little prince took his lumps. Then, under the huge wing of “The Big Aristotle” and a wise wizard, “The Zen Master,” he learned and matured. Seeing the unrest, and at the behest of “The Doctor,” the Zen Master returned from the North to reunite with his Young Ruler. Oddly enough, the Ruler HAD knights worthy surrounding him all along. The “Power of the Triangle” was what made the Ruler and his Knights a fabulous show for all times. However, as valiantly as they battled, “The Angeleno’s” could not climb out of the “Valley of the Sun.” The ruler pleaded for help. During the middle of the next attempt, a “Spanish Conqueror,” majestic among his people and ruler of his court, was summoned. The new trio and their band of merry men began to steamroll through the Western Civilization, which included “setting the army from the valley of the sun.” The, now, experienced Ruler was happy again and loaded with knights to again take his rightful place atop the whole hoops kingdom. Alas, in his quest, the Ruler and his army were stopped by the “Green Leprechauns” from the East who, at the expense of The Angeleno’s, added rings to their not so hidden treasures. The Ambitious Ruler vowed he would regain the ring. In the next attempt, his 30th year on this Earth, The Angeleno’s ascended to the top of the Hoops Kingdom. Of course, the story was about Kobe Bryant and the World Champion Los Angeles Lakers. What drives “Kid Kobe” is winning. In the Kobe Era, the Lakers have won four rings in six attempts. Kobe’s got one league Most Valuable Player Award and one Finals MVP. The difference, the Four Rings. At the moment, for “King James” it’s about individual stats. Two league MVP’s. Zero for one in the Finals. Brings me to this. The Cleveland Cavaliers have assembled a team around LeBron that’s absolutely good enough to win a World Championship. After two straight bad losses in the Eastern Conference Semi’s to the Boston Celtics it looks as if he seems to lack two skills Kobe’s mastered. LeBron’s not a facilitator, meaning he still doesn’t know how to bring out the immense talents of his teammates, especially when he’s having an off night. Also, LeBron’s clearly not the closer Kobe is. He can, but not consistently, go for the jugular and put an opponent away the way Kobe can. In the Cavaliers 32-point game five loss to the Celtics, Lebron was so not in the loop, he looked more like the 12th man off the bench. Subsequently, his teammates, who are programmed to defer to LeBron, looked so lost it appeared they had never played basketball before that particular game. Except for four-time world champion Shaquille O’Neal who is playing consistently well in these playoffs. Says plenty about Lakers coach Phil Jackson. He won his ten rings, and is on his way to battling for number 11, because all his players are big parts of any game-plan. Kobe’s the focal point as Michael Jordan was with the Chicago Bulls. But the rest of the team, which is ten deep, understand they have to contribute, even when Kobe has an “off night,” if the Lakers are to win. 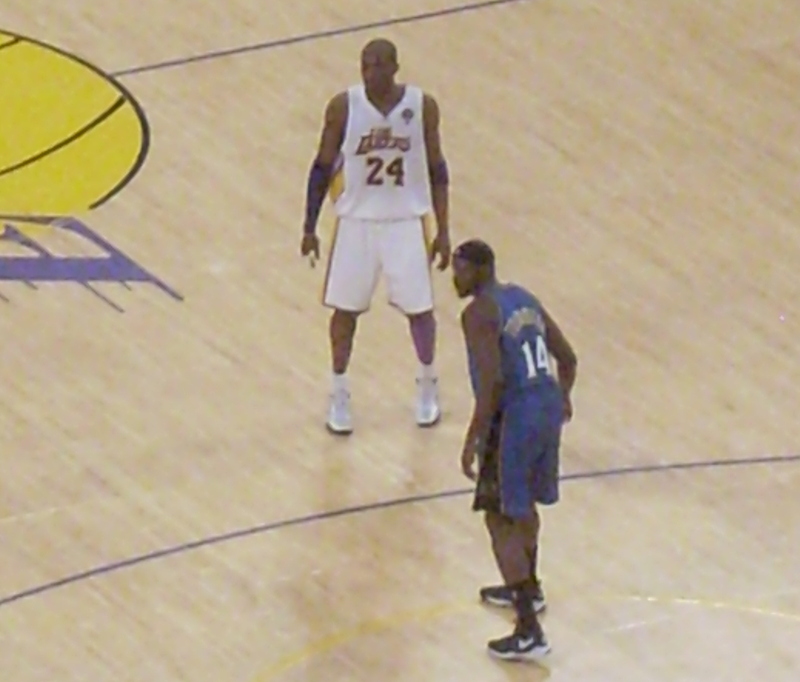 At the 2008 Beijing Summer Olympics, both LeBron and Kobe were part of the Gold Medal winning Team USA. Who was the absolute leader of that team? Kobe. Realize LeBron’s just 25 while Kobe’s now 31. “King James” will have his moments and championships. Realize the Cavaliers, despite that tank-job losing to the Celtics 120-88, are still alive. Free agent to be “King James” can still conquer the court and get a ring this year. However, I think it’s way pre-mature that people have passed the “Best Player on the Planet Torch” from Kobe to LeBron. For one reason and one reason only.